A quicker release has been cited for Roethlisberger’s career-low five interceptions and his 32 sacks, which, while not necessarily low over 12 games, represents an improvement over his previous four seasons. 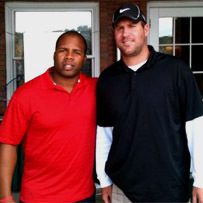 Roethlisberger took the month he could not appear at the Steelers’ facility to work with quarterbacks coach George Whitfield Jr., and he tinkered with his delivery. Whitfield, who runs a private quarterback-training firm in San Diego, suggested the change to Roethlisberger when they began working together in September. He had used the same motion since high school, and no one suggested he change, likely because he had been so successful. You can see photos of Ben’s workouts with Coach Whitfield here. For the regular season, Ben was third in the league in yards-per-attempt and not only leads all active quarterbacks in that category, but is fourth all time. “There’s a lot of times when he’s outside the pocket that he’s far more dangerous than when he’s inside the pocket. And that’s not to say he’s not good when he’s in the pocket. But his ability to throw accurately on the run and on the fly and just create stuff is just uncanny.” — Ravens linebacker Jarret Johnson on Ben, from an article in the Baltimore Sun. “Some quarterbacks will go down when they get people around them, but not him. The play’s never dead with him and that’s something you’ve got to watch out for. It’s tough to play against. You just got to get lots of helmets on him and get him down.” — Ravens nose tackle Kelly Gregg on Ben, from the same article. Ben was interviewed today for a segment to be shown on CBS Sports’ The NFL Today show this Saturday prior to the game.